As much as the offices of today are openly designed to promote creative thinking and collaboration, sometimes the best ideas are fostered outside the office. 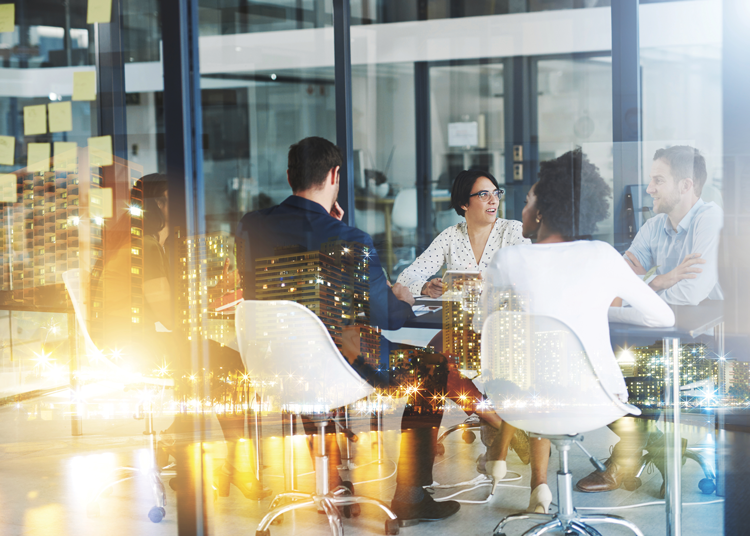 Spending time with associates away from work can build loyalty, boost enthusiasm, and spark innovation — outcomes not always possible even in the most nurturing office environments. Many assume that off-site meetings can be replaced with technology and virtual conferences, and to some extent, that is true. However, consider the “why.” Why do you want employees to get together? Because you know that there is a difference between screen time and face-to-face time. Sharing a round of golf, a stroll through a bustling city’s art museum, or a meal together can do so much for the body and mind. That personal interaction translates to colleagues who enjoy success in themselves and others. Whether your meeting is for two or 20,000, these Michigan venues offer the best in facilities, accommodations, catering, and comfort — all essential elements in fostering creativity. At Grand Traverse Resort and Spa, meeting attendees are saying farewell to ice breakers and trust falls to do something different with their teambuilding time. Why philanthropy? Meeting planners are attuned to the fact that volunteer work has benefits for both the community and for their company. A study from United Healthcare found volunteering leads to strengthened relationships between employees and employers and also promotes physical and emotional health and well-being. In recent meetings at the Resort, the Michigan Credit Union League built over 300 children’s bicycles, the Michigan Society of Association Executives filled backpacks with school supplies for kids in need, and Farm Bureau Insurance made teddy bears to donate to a local hospital’s pediatric unit. “We believe in giving back to the community, and because the Grand Traverse area is small and tightknit, we’re able to access more organizations and make a greater impact,” Buck says. With a passion for giving back and a dedication to creating the best possible meeting experience, the Resort’s sales and conference services team is used to going above and beyond. For your next meeting, let them help you do the same. To learn more about holding a meeting or event at Grand Traverse Resort and Spa, visit www.grandtraverseresort.com/meet. 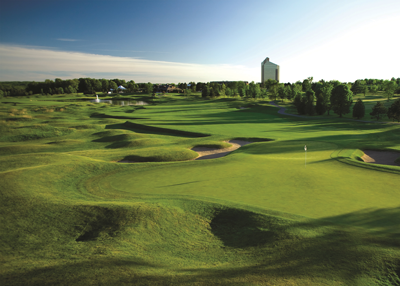 BOYNE is a collection of year-round resorts known for great skiing, golf, and spas. In addition to its skiing operations, BOYNE facilities include the Inn at Bay Harbor, Bay Harbor Golf Club, Crooked Tree Golf Club, the Avalanche Bay Indoor Waterpark at Boyne Mountain, Boyne Country Sports, and Boyne Realty resort sales. Boyne Mountain has accommodations to meet every budget. Diverse lodging options are perfect for any combination of guests, from families to business travelers. Summer guests enjoy golfing on two championship golf courses, tennis, swimming, fly fishing, mountain biking, hiking, and kayaking. Winter vacations at Boyne Mountain offer the Midwest’s best downhill skiing, snowboarding, cross country skiing, snowshoeing, and tubing. Since 1963, groups from six to 600 have enjoyed the facilities and activities Boyne Highlands has to offer. Guests at Boyne Highlands have made a tradition of active sport, tranquil leisure, and building memories among the rolling hills of northern Michigan. 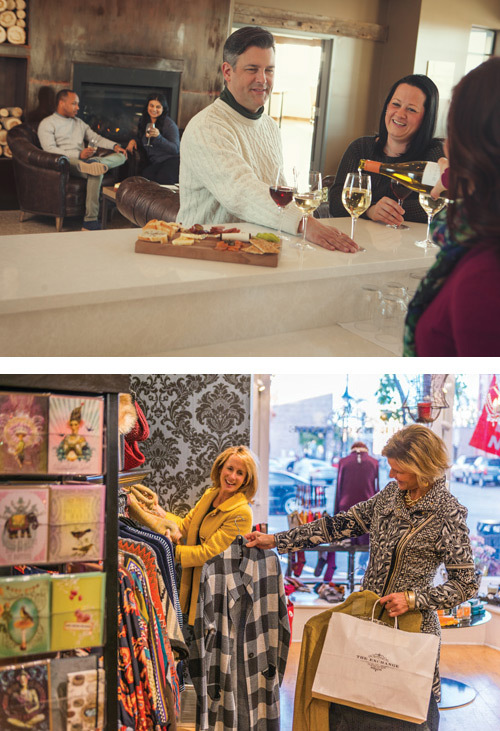 Never pretentious, always welcoming, Boyne Highlands is an oasis in an ever-changing world. For more than 100 years, vacationers have made their way to a certain spot in Petoskey with a reputation as being the perfect vantage point for viewing sunsets over Lake Michigan. In 1998, that site became home to the Inn at Bay Harbor. 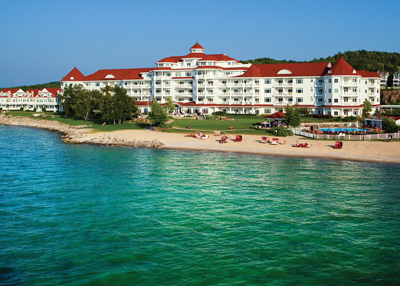 With 45 holes of championship golf, a full-service spa and salon, award-winning restaurants, world-class shopping, and a marina, the Inn at Bay Harbor is the ultimate destination for corporate retreats, conferences, and seminars. At the Amway Grand Plaza, Curio Collection by Hilton, JW Marriott Grand Rapids and Downtown Courtyard by Marriott, guests can expect more — plus that little something extra. Each hotel has its own unique style and personality and offers comfortable, wellappointed guest rooms designed to delight business travelers and weekend wanderers alike. Hungry? 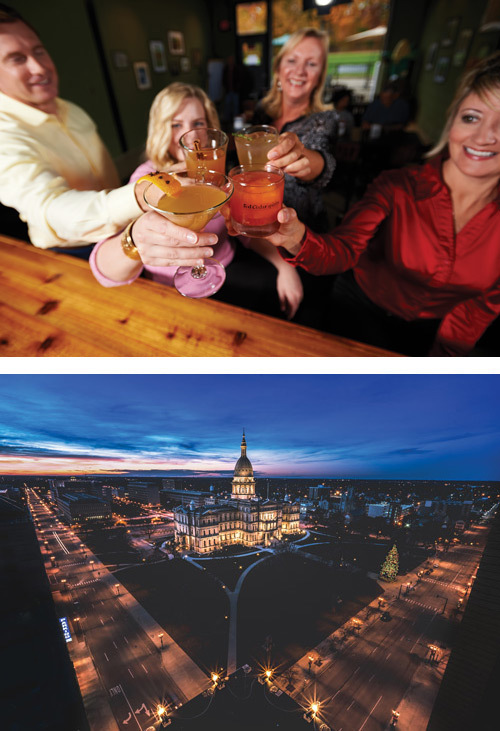 Our hotels are home to some of the city’s best dining experiences from Ruth’s Chris Steak House and Cygnus27 to The Kitchen by Wolfgang Puck and six.one.six – French Bistro. Combine that with our meeting and convention space located in the heart of downtown Grand Rapids, and the results are memorable experiences second to none. From the perfect meeting venues to the perfect meeting menus, our team will help plan your next power breakfast, banquet, or convention — regardless of size. Also, via a climate-controlled skywalk, each hotel is connected to each other, as well as to DeVos Place Convention Center and Van Andel Arena — so weather won’t keep your guests in one place. In fact, with over 70 restaurants, bars, breweries, live music venues, museums, and more within walking distance, guests can get out and explore. The region offers more than 4,500 affordably priced hotel rooms set amid unique attractions, restaurants, and more. 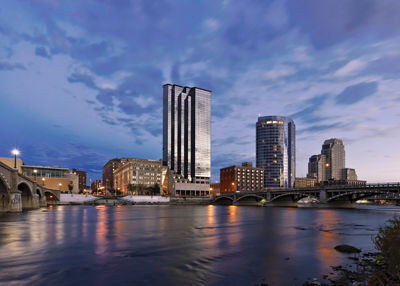 The Lansing Center, located downtown on the banks of the Grand River, has more than 71,000 square feet of column-free exhibit space and an additional 25,000 square feet of pre-conference public space. The Radisson Hotel Lansing is conveniently connected to the Lansing Center via a covered pedway. Three miles away, on the scenic campus of Michigan State University, the 254,000-square-foot public arena, the Breslin Center, is adjacent to the award-winning Kellogg Hotel and Conference Center. The Italian American Cultural Society Banquet and Conference Center is a full-service event venue equipped to host gatherings of all varieties, with rooms to fit anywhere from 20 to 600 attendees. Professional staff members provide first-class service for team-building sessions, group seminars, skill workshops, and company parties. State-of-the-art, newly updated sound and projection equipment ensures crisp audiovisual presentations, while our top-rated kitchen keeps guests full and focused with customizable menu options for any occasion. If you are looking for a venue that can also accommodate an after-hours cocktail reception, the Italian American Cultural Society also has additional areas on-premises perfect for both an indoor or outdoor affair, including a custom bocce ball court. 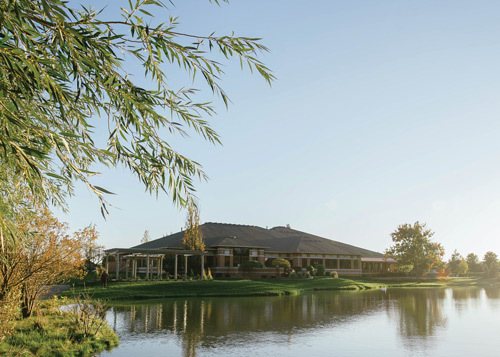 Nestled in a serene wooded expanse overlooking a pond, our meeting rooms are the perfect environment for both learning and socialization. Conveniently located only minutes away from The Mall at Partridge Creek and many great business-friendly hotels, The IACS is both easy to find and conveniently located for out-of-town colleagues or clients. To speak to an event coordinator today and schedule a tour of our property, please contact us at 586-421-5155 or banquet@iacsonline.com. Please also find us online at iacsonline.com. Mother Nature inspires. Wide open spaces promote outof- the-box thinking, and bonding becomes the most valuable business tool. When your team is surrounded by the beauty of Northern Michigan, suddenly everything becomes more attainable. No matter what you set out to accomplish, both the experience and the results will be unforgettable. 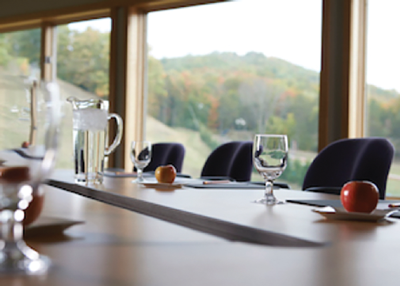 Crystal Mountain is the perfect place for your corporate retreat, industry conference, or team-building exercise. Our Crystal Center is an award-winning designated conference facility prepped with everything your team could need for an inspired meeting: space for up to 350 attendees, breakout rooms, presentation technology, inhouse technicians, and Conference Services Managers to coordinate it all. Crystal Mountain offers over 260 lodging rooms and endless recreational activities. Your group can enjoy team-building activities on the golf courses, biking and hiking trails, on the ropes course and zip line, or around a bonfire. Make it a meeting they’ll remember. Corporate events have changed. They are no longer boring, mandatory gatherings. 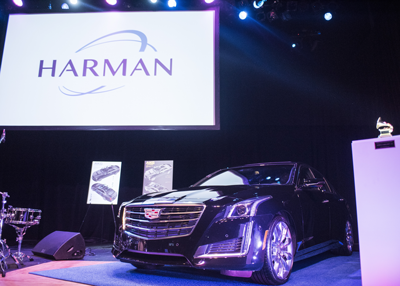 The new directive is to excite and inspire guests while delivering the company’s message in a meaningful way. And for us, a science. We create innovative ways for guests to interact with the brand so that all senses are touched. We help create unique immersive branding experiences that guests obsess over. This means the message you send is received, elegantly and (almost) subliminally. Guests become brand ambassadors and your message is enthusiastically spread, grassroots style.